A type of crane, which has a horizontal member (known as jib or boom) that supports a moveable hoist fixed to a wall or to a floor-mounted pillar is known as jib crane. Used mostly in industrial premises, the jib may swing through an arc, giving additional lateral movement. 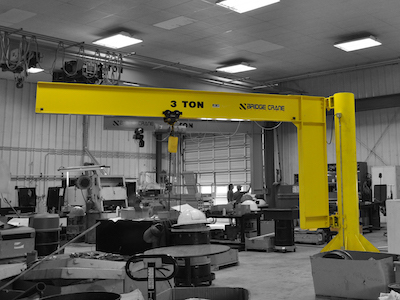 Our Jib Cranes are designed to assist with a wide range of lifting tasks, remaining incredibly versatile while handling heavy loads in a specific work area, and assist well in multiple moving operations which contributes to your daily productivity and overall success. Jib Cranes can be utilized in a number of environments.